Polyester Glitter vs. Craft Glitter - Glitter My World! Glitter My World sells two distinct types of glitter. We sell Craft Glitter and Polyester Glitter. The glitters are made from different types of films and are made for different types of purposes. The information given on this page is here to help you make the right choice. The information below is given as a general list of uses. The glitter can be used for more than this, but this gives you the basic idea. Always do tests with the glitter before beginning your project! Why use craft glitter? Craft glitter is very affordable! 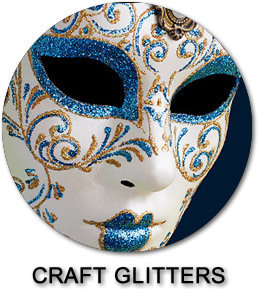 If you have a big project, need to fill a bit space, or have a limited budget, then craft glitter is a great choice. It is much less expensive than polyester glitter. The larger flake craft glitters bounce a ton of light and are super sparkly. If you are going to be viewing the finished project from a distance then large flake craft glitter is perfect. Fine flake craft glitters are good up close, but if you view it from far away that lovely sparkle tends to fade away. Why not to use craft glitter? Craft glitter is basically an indoor glitter (it prefers limited sun/water exposure). It will probably survive a Summer outside and some rain downpours, but if you expect it to hang in there year after year it won't. The glitter is too heavy to wear on your body and cannot be used with solvents (so no nails). 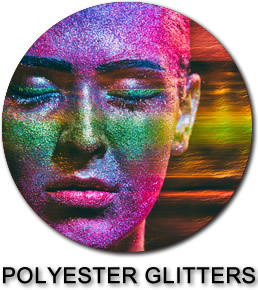 We sell a number of different polyester glitters. Each type has unique properties. The description we have created for each glitter will spell out any limitations it may have. Why use polyester glitter? This type of glitter is very versatile. It can be mixed into things, stands up to many solvents, is gorgeous, and comes in lots of colors and types. A new trend in glitter is the new FDA Certified Cosmetic Grade glitters. These glitters have had the pigments tested and stamped as safe for wearing on skin. This is not to say that the other non-cosmetic grade glitters are not safe. They just have not had the expensive and extensive testing done. If this seal of approval is important to you be sure to shop the Cosmetic Grade section of the website. Why not use polyester glitters? Polyester glitter is generally very expensive! If you can afford to use polyester glitter and it fits your needs then go for it.